Kid friendliness: tiny patio to eat along a busy alley, but cheese sandwiches and fries are definitely kid friendly. With almost 20 types of grilled cheese sandwiches offered at Toasteria, there's a lot to choose from. Not to mention the fries, salads and fish and chips. From the basic classic grilled cheese (with cheddar, mozzarella and "good olive oil) to the tuna melt to chicken options to unique combos like Grapa (Grilled Gouda, red wine onion jam, roasted garlic and fresh basil)- Toasteria uses cheeses like cheddar, mozzarella, feta, gouda, jack, and various combination with aioli, honey mustard, roasted peppers, pesto garlic and even wasabi! I was in a hurry so I ordered my classic grilled cheese (NT$70) to go. It's definitely better to grab a seat (if they have one available) and eat your sandwich hot off the panini grill and the combo addition of fries and a drink for NT$60 is not a bad deal. I opted for Grape Fanta which I hadn't had in forever, and it definitely made me feel like a kid again, drinking grape soda with my grilled cheese. THe fresh basil is also a nice touch, giving the sandwich an extra layer of depth. The patio, while small, is a nice place to people watch and eat if it's not crowded, and there's also seating along the bar. Right next door to the Zhong Xiao Alleycats (not TOO far from SYS Memorial hall), you should wander over to check it out, even if you are looking for a hot midnight snack with their late hours on weekends. Next time, I want to try the Grapa (NT$95), the Chicken Jack Cheese (chicken, grilled jack cheese, caper aioli)(NT$95), the Tunamelt (NT$85) or the Feta Pesto (roasted pepper, shiitake mushroom and onion). If you like your croissants on the sweet side, then you definitely have to try Mini One. I first had these freshly baked croissants a few years ago when Donq had a little corner bakery in A11. But when they moved to A4 and was replaced, neither location had the chocolate croissants that I liked with a slightly chocolately center. While these mini-ones are not as mini as I remember, they still have a crispy outer shell (because they are brushed with sugar water after they are taken hot out of the oven) to reveal the flaky layers that get softer to the core. For NT$50, you get 4 croissants (100g) where I think previously you got 6 (because they were smaller). As with most of the baked goods here, you should eat them right away or within the day or two. They also sell little cheesecakes, but I'd choose the chocolate croissants over the other options anyday. If you can't decide, you can wander to the counter and try out samples of each. BTW- if you haven't been to A11 foodcourt lately, they've remodeled it. KFC is no longer there and most of the food court options are of the Chinese variety. Kid friendliness: No high chairs. Reservations (especially on weekends) strongly recommended. A popular place in Gongguan area for burgers, Mexican fare and hanging out- Bongos has gained a following with both locals and expats for its affordable American-style eats and casual atmosphere. I didn't expect it to be so packed on a Sunday night, but I'm glad I had called ahead and made reservations for my party of 8. Otherwise, I might have been turned away to Coda (the owner's newer restaurant nearby) or had to wait, as we witnessed happened to walk-ins. I was also surprised that it appeared that all the other customers were younger locals and I didn't spot any expats at all. It's very close to Taida (the nickname for National Taiwan University), so maybe many of them were students. In the hustle and bustle, we were seated in the darkness of the outdoor patio, which was not bad in the cool weather, but very dark. A few of friends complained they must be getting old since it was hard to read the menu in the night's light. They have separate menus (with a few pictures) for Chinese and English and after request, I got an English menu instead. With appetizers, salads, burgers, Mexican, pasta and main dishes offered, most of the meals come w/ your choice of 2 sides (fries or salad) and a drink. Having been to Forker first, I recognized a lot of the fonts and identity styling had come from Bongos. While waiting for the rest of our friends to arrive, we ordered the quesadillas (NT$260) (offered as a meal, not appetizer) a side of chili cheese fries and small salad, as well as the Five Layers Mexican dip (NT$180). I was excited about the guacamole in the dip, but could barely find/taste it as the spicy salsa was the overwhelming flavor. There were also not enough chips to finish the dip (as with our experience w/ the spinach artichoke dip at Forkers). I tried to request more chips instead of fries when I ordered my burger, but they wouldn't do it, saying extra chips would be an extra NT$20. I definitely wouldn't order this again for the size and price. The quesadillas were pretty good on the other hand, cheesy and meaty with a kick. The chili on the chili fries was thick and disappeared quickly. The bowl of mushroom soup was also surprisingly good- it was creamy and aromatic and actually quite kid friendly. The side salad that comes with the meals was quite blah, as was their chicken entree salad which had slim toppings in a huge bowl of lettuce. We tried to order their udon salad at first, but they had run out of udon. Instead, stick to their burgers. I ordered the bacon gouda cheese burger (NT$240) and requested guacamole on top (for extra NT$) and the burger was a lot better than my burger at Forkers. The wheat bun, meat patty and toppings all meshed together (after I picked ou the sprouts. I hate sprouts) to be a pretty good bite. I was quite full after the quesadilla and chili fries appetizer and was unable to finish my double fries order with my burger (plus I was saving room for shaved ice at Tai Yi nearby afterwards). My friends enjoyed their chimichanga, burger and sausage dishes. I thought the chimichanga was okay with spiced ground beef inside, but preferred the chimichangas at Jake's Country Cafe or La Casita,. Bongo's Mexican is more Tex-mex, if that. My friend also tried to order a pasta dish, and they were also out of that. There's no automatic service fee included in your bill, but your drink refills and water are self serve. They are quite busy getting to all the tables, so service can be on the absent side. I'm glad I found it after getting lost in the taxi the first time. Now that I think about it, we were probably RIGHT around the corner and missed the small entrance, since there are no side signs in the one way alley, but instead right in front. It is easier to find from Xin Sheng South Road... as we walked around, there were a TON of little eateries and shops that I wanted to come back to check out. Any other recommendations for this area? It can be a bit tricky to find, so I'd suggest looking for Tai Yi Milk King on Xinsheng S Road, and then taking the alley to the left of it, go three alleys past Wunjhou St and then turn right. It should be on the corner, on the left hand side. Look for white gates if you don't see the sign, or give the restaurant a call for directions. 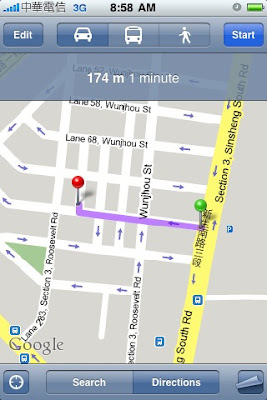 The green pin on the map below is Tai Yi, the red pin is Bongos. "No reservations? No enchiladas for you!" Have you ever seen that SEINFELD episode with the Soup Nazi? He has a set of rules that you must abide by if you are to eat his food, abuses his customers, but even though he is so mean, the customers can't help but to buy the soup. I feel like I was in a Taiwanese variation of that episode after my lunch experience with La Casita today. There really is no where to get decent Mexican food in Taipei... so despite my previous up and down experiences, I thought I'd head over to eat some chicken enchiladas during lunch. It's never been completely full when I'm there, so I figured I didn't need to call ahead to make reservations. Boy, was I wrong. When we stepped inside, it was empty, though the tables were separated into large configurations. I figured some reservations were probably made. The owner asked if we had reservations and after saying, no, he bluntly stated they were booked. He pushed, "All my old customers know that they should make reservations." Okay... well, shouldn't you treat all your customers with respect whether or not they are new or old, make reservations or not? While my mom offered congratulations for being so busy, he said, "No need for congratulations, I'm booked at lunch til Friday." I asked if we could to-go something, he reluctantly agreed, saying that the kitchen wasn't really open yet (though they open at 11:30am and it was already 11:45am) and said if wanted to to order, we should hurry because once his "reservation" customers arrived he would not be able to help us. He also very reluctantly agreed to let us sit down while we waited for our order. Keep in mind the restaurant is COMPLETELY empty at this point. His demeanor was just so uninviting and downright rude, I was about ready to leave without ordering anything. I was torn. Should we just walk out and away from his attitude? But I figured I came all this way, I hadn't eaten Mexican in so long, I might as well order what I wanted since my friend and Mom didn't care. Even while ordering, he was pushing me to hurry. I felt like if a "reservation" customer walked in, he would tear the menu away from my hands and no longer let me order. As our order came out, it was 12:08pm. The restaurant was STILL empty. He could have sat us down, served us and we might have been out the door by the time all his tables came in. Or at least gave us a semi-apologetic response and kindly asked us to make reservations the next time. I ate some of the nachos with cheese, beef and guacamole (NT$300) in the car and my chicken enchiladas with rice and beans (NT$280) at home. The guacamole made with imported avocados was freshly made and did hit the spot. But the whole experience definitely left me with a bad taste in my mouth. When I complained to my friend that the owner was mean to me again (he had been with me and our friends the last time the owner was cranky), he said, "I should get mad at you. You should have left without ordering anything and you should not support his business and his attitude." My girl friend who had come with me tried some of the food and agreed that it's the best she's had in Taipei, but that she just didn't understand why the owner was such an a-hole. Before I headed over today, I was excited about re-reviewing the place and giving it a good recommendation, but after the way we were treated today (I don't think it's out of the ordinary), I can't recommend it despite the food being good (for Taipei) especially to new (or occasional) customers who aren't going to be treated with respect. I'm not even angry (like with the terrible service at Diamond Tony's), just really sad since it could be a place I'd like to eat at often. I guess if you are really desparate to eat there, just be sure to make reservations and deal with crochety service. Should I have left without ordering anything? Have you ever endured bad or even rude service for food? After a friend of mine told me how awesome her Hello Kitty sandwich maker was, I tried to find one for awhile in Taipei. None of the Sanrio stores really knew what I was talking about and I finally found one, GUESS WHERE, at Watson's of all places!! It was a pretty good deal at around NT$500 (I bought it awhile ago, I forget exactly how much!) and it actually makes REALLY good toasty cheesy sandwiches. I just bought some goat cheese and gouda cheese (SO GOOD) from Costco last week so I will probably be making some goat cheese honey ones and some gouda canadian bacon ones. I love how the sandwich maker seals in the melted cheese and makes the bread all crispy like it's almost fried, but without any oil. The slightly burned HK face is really cute too. So who remembers me craving lemon meringue pie? (You guys were no help, by the way!!) Who knew there was a supermarket and little pie shop in Sogo???? My friend wanted to get some drinks from Sogo's supermarket and I had only been to their food court on B1, so she introduced me to another basement floor I'd never been... that actually had lemon meringue pie among a ton of other kinds of pies. Rose Pie's offerings looks like Taiwanese King's Hawaiian with more fruit and cream type of pies, but I almost gasped in surprise when I saw the lemon meringue with the fluffy egg white meringue topping. You won't spot apple pie or other crust topped pies here. While I did have my craving satisfied by a birthday gift from a friend a few weeks ago of a lemon meringue pie from Home Cake (to be reviewed! ), I couldn't resist checking this out. In comparison, I'd have to say it was not tart or sweet enough for my American tastebuds, but they did a good job with the meringue and flaky crust. I'd like to go back and try the fruit custard pie, tiramisu and cheesecake. I guess pie isn't really a big thing in Taiwan yet- it's mostly about the bread and cakes here so far. Based on their brochure, they seemed to have originated from Taichung and only have this location in Taipei. You can buy pies by the slice (around NT$45) or over 45 different kinds of whole pies (NT$300-450), as well as cakes. Check out their website to see pictures and the various styles they offer. If you've been in Taipei long enough, you will eventually try the oyster omelette or "oar jien." And maybe even like it enough to crave it! A semi-chewy scrambled egg dish with small oysters, chopped chinese cabbage and a sweet reddish/brown sauce on top completes it. The addition of starch in the egg makes it chewy and slightly gummy, but it should compliment the egg rather than overwhelm it. Most food courts (and night markets!) wouldn't be complete without a oyster omelette store with a side of vermicelli, fried noodles or fried rice. Sets include omelette, side and meatball soup for only NT$100. It might sound weird to eat have oysters in an omelette if you've never tried it, but it's not really a breakfast food like American style omelettes which usually have cheese. The size and sauce makes it more like a snack. At this location, it's a bit starchy around the edges with an okay amount of oysters, the noodles may have been sitting around for a bit since it's the afternoon and the soup is good, though I like the brown meatballs better than the blander white ones. If you don't like this set, they also offer fried pork chop on rice, fried tofu, vegetables and "lo bah beng" (Taiwanese) or "lu rou fan" (Mandarin) which is stewed fatty pork and soy sauce over rice. The best part about this food court is that you can get some do-hwa or (dessert soy tofu) afterwards or leisurely browse the English or Chinese books on the multi-level store which is open til 2 AM! It's fun watching vendors make the oyster omelettes at the night market, though with any seafood you have to hope you're getting something fresh. It should NOT taste or smell fishy at all, so if it does, don't eat it. French toast is probably one of the easiest breakfast foods to make- you just need bread, an egg, milk and a hot pan. I like to add a little vanilla extract as well, but it's not a must have item if you don't have it in your kitchen. I don't know why I don't make it more often or why I felt like making it this morning, but it was easier than trying to get it to-go from NY Bagel. Someday I'd like to try it with challah bread or french bread, but it tastes great with regular sliced bread too. - Finally found Bongos and had some awesome red bean and mochi shaved ice at the very crowded Tai Yi afterwards. - Said farewell to fellow Taipei bloggers haochr at Mary's Australian Bistro. Have fun back in the states- we'll miss you! I guess you could call Citystar the Denny's of dim sum restaurants, it's open 24 hours, it serves food that's not awesome and not awful, and you even might have to wait for a table in its diner like atmosphere where families and students and friends gather. I totally didn't expect to have to wait for a table around 2pm, but I guess its location and window facing the busy street makes it visible wanting some fast afternoon snacks. We waited about 15 minutes for a table to free up and get seated. The plasticky menu pictures everything they have, so there's no carts to wave down. They also have a non-dim sum menu featuring family style Cantonese dishes, but we were here for dim sum (NT$55-160). After the servers take your order, they punch it in a computer station that's kind of fascinating to watch. One of my favorites- "xian shui jiao"- is a deep fried puff of salty contents of shrimp, ground meat and vegetables and a sweet glutinous rice skin. It's not always available at every restaurant, but this was one of the better dishes. I would actually go back and just eat this and almond tofu. Everything else was, ehhh, ok. I was with my dad who was visiting from LA and grandma who lives in Taipei-- my grandma and I agreed that the dim sum at Brother Hotel was better. Couldn't pinpoint why to my dad who hadn't been, but funnily enough my friend invited me to join them at dinner at Citystar that same night with a big group of his co-workers (I didn't go, but he said that he felt the dim sum was okay as well). So it's a good choice if you have a lot of people to order a lot since they do have some bigger family style tables and share or if you're by yourself and just want a few dishes- fast and easy, even in the wee hours of the morning. You can even people watch by a window seat on the busy street below. I did enjoy the almond tofu, but then again it's hard to go wrong with almond tofu! Kid friendliness: no high chairs, smallish space, but lots of kids and families and fairly friendly service. Thank you, thank you to readers Virginia and Joshua for telling me about Pho Hoa. It is by far the best pho I've had in Taipei and quite comparable to the pho joints that I frequent in LA. I owe you guys, seriously. Why is it so good? I don't know. Supposedly, they used to be a part of the chain Pho Hoa according to a November 2000 Taipei Times article (but no longer? They are not mentioned on Pho Hoa's official website). But maybe they retained the secret recipes and standardization that makes it so different from adjusted-for-Taiwanese-customers eateries. And apparently the Taiwanese customers don't mind. We walked in around 2:30pm and it was packed full. We ordered while we waited and were shortly seated among the 30 or seats in the clean, modern and air conditioned space with a semi-open kitchen in the back. The menu is in English and Chinese at the front counter and you pay before you sit down. I think I saw some hidden plastic menus with pictures too, in case you don't know what the different kinds of pho available are. Basically you can get it with hot soup with various meat toppings or dry with chicken, shrimp or pork chop, in small or large sizes (NT$120-$180). It's more expensive than the mom and pop places, but here, you know what you are getting and I think you get your money's worth. They also have Vietnamese coffee or milk tea (NT$50) and soft drinks. They offer fried spring rolls (no summer rolls) which are served hot and crispy with ground meat, glass noodles and chopped veggies. It's not a steal at 2 for NT$80, but good if you are craving it. They also have sliced papaya salad (NT$35) and limited starters. Most importantly, Pho Hoa uses the skinny rice pho noodles, rather than the wide noodles I've been seeing everywhere. Their broth in the soup pho is a right combination of salty sweetness flavors and depth- not too oily or murky. And they give you the side plate of fresh lime, basil and chili slices, sometimes upon request, sometimes upon sitting down. I like getting a big bowl of rare steak pho (NT$160) and watching the thin slices cook in the broth before I eat it, squeezing a bit of lime, tearing up some basil and adding some of the sweet hoisin sauce into the broth. The dry phos (NT$120-150) are not served cold, but with warm, slightly wet noodles, with a side bowl of hot soup. There are crushed peanuts, pickled cucumbers, cilantro and sprouts side by side with the sliced pork chops (which have been marinated in basil?) and all the flavors again mesh well together and you just want to inhale the whole bowl. I was kind of weirded out by the green appearance of the pork, but it quickly faded as I took my first bite. It was SO good. I took some friends back to Pho Hoa the next day so I could order that dish again. With more people, I got to check out the dry shrimp pho and dry shredded chicken pho dishes. While it was pretty full when we got there, it emptied up and then filled up again with customers, though it was into 2-3pm in the afternoon. Maybe I was just too pho-deprived, but it was still really good, two days in a row. My friends agreed it was one of the better bowls of pho they've had in Taipei, too. It can be a bit tricky to find- closer to the Zhong Xiao/Dun Hua corner/MRT rather than Sogo- though it's kind of in between. If you are coming from Zhong Xiao/Dun Hua, you have to head towards Haagen Daaz and cross Dun Hua into the lane 190, parallel to Zhong Xiao. If you are coming from Sogo- look for the Bossini. Also, interestingly enough, they have a Mr. Roll area in the front where they sell mixed rolls "from California." Didn't get to try that, but in case you are craving California rolls you could check it out. Kid friendliness: booths and tables. no high chairs. kids menu available- though only chicken nuggets and fries set with pudding/drink. When I looked at the menu on my first visit, I wanted to order the ramen. But on that day, they were "out." So I ended up getting the Deep Fried Pork Curry Rice set (NT$178) which comes with a choice of drink and dessert. Served hot, perfectly crispy and not greasy or dry- the tonkatsu looked and tasted good, served on a bed of shredded cabbage and bowl of rice. When I ended up going back another day jonesing for ramen, I was quite disappointed. While the tonkatsu was a great bargain and taste for the price, the Shinso Miso Broth ramen (NT$188) was ordinary, even disappointing. The miso broth didn't have the slurp me down flavor and the chashu (slices of pork) was forgettable. I don't know if the Hakata Porkbone broth or the Wakayama Soysauce Porkbone broth would be any better. The menu is in English and Chinese with plenty of pictures and nothing is over NT$228- and that price includes a choice of drink (Tang-like OJ, tea or coffee), and dessert (chocolate chip ice cream or japanese mochi). This is probably why on my second visit the restaurant quickly filled up during lunch, with groups of students dressed in uniforms, sitting alongside with the business crowd. The ice cream tastes similar to Movenpick's slivers of chocolate chips rather than chunky, which is a good thing. They also offer a kid's set menu (NT$148) which includes a drink and pudding dessert, though it's disappointing that it's frozen chicken nuggets alongside fries and a onigiri (or rice triangle) without an option for kid's size tonkatsu like my favorite Taipei tonkatsu place, Saboten. Although for the difference of NT$20, you could just order the adult set of the Japanese Deep-Fried Pork (NT$168). I think the tonkatsu may be their specialty, but they offer a wide array of choies including ramen, sukiyaki, roast eel unagi bowls and roast mackarel, teriyaki chicken bowl, deep fried chicken leg and rice bowls (oyako-don and katsu-don). There's a lot of tonkatsu/Japanese places around Taipei, even in the food courts, but I've tried many that were just so-so... too dry, not hot enough, not crispy enough, not flavorful enough... so this was a good find in a modern, clean, bright setting. It can be a bit hard to find, tucked in a small alley. The address states an alley off of Da An Road, but if you are taking the MRT/taxi/walking, it's in the alley adjacent/behind Dun Nan Sogo (right past Lao Yo Ji if you know where that is). Trying to reconfirm the search and recapture the magic of my memories of a decent waffle in Taipei, I headed over to Grand Regent Formosa one morning. I don't know if my fuzzy memory served me incorrectly or that the hotel has just changed, but I can no longer vouch for the waffles there, much less their breakfast. Okay.. a few years ago, when I went on the hunt for an American style breakfast, my cousin and I taxi'ed all over town to finally land at a hotel that would serve us breakfast past 10am. I remember driving up the steep hill and sitting in an open space which is why I thought it was for sure the Grand Regent Formosa. But present day, Azie (their lounge-y restaurant) is not open for breakfast so we're directed towards their buffet, Brasserie, which already feels not right. But we still forge ahead, we're here, we're hungry and we'll check it out. We don't have the appetite for the full buffet breakfast, and they do have an ala carte breakfast menu. It's not a bad price for a hotel eatery, but later on after we get our food, I suspect it's because they just plate stuff that is being served from the buffet! The waffles were cakey and dense, far from the crispy lightness I remember from so long ago. I think I saw the waitress bring it from the buffet waffle chef. It's made to order, but the batter is just too thick for the waffle to be fluffy. I barely finish one quarter of the waffle and leave the rest on the plate. The eggs (pictured first) are overdone and inedibly dry, and served with a side of broccoli (for breakfast? ), reheated triangle hash browns and dry slices of ham. The omelette was a tad better- a lot of ketchup helps too. In the end, the hash browns (though probably frozen and reheated (not even refried)) are the best thing even though even they aren't good. I can't say if the food we ordered reflects on the food at the buffet, but it has to a little bit if it's coming from the same kitchen, right? Because it's a buffet setting, there's not really any service even though we ordered from the ala carte menu. I almost hope that since it's a fancy hotel that they would ask if there was anything wrong with our food when most of it is left on the plate, but they do not. I even dare ask the waitress if there is a different waffle available, to which she gives me a very confused look. I guess it's back to making my own breakfasts. Shanghai Tea Bistro is a relatively new addition to the growing Lane 233 (one alley away from Dun Hua Eslite) of eateries that include Ginjer Bakery, Rose House, Casa Della Pasta and the also new-ish Dubu House. After sampling three different things, the Sorrowful Rice (NT$100) with slices of char siu bbq pork, an over easy egg and a few bites of bok choy over a heaping bowl of rice was the easy favorite. From the looks of it, a popular order for a lot of the other tables nearby as well. The pork is slightly sweet and very tender and you wish there was more of it. It's even better than the char siu from Lao Yo Ji. If you want to order it, order #1 from the pink House Specialties menu. It comes with a soup of the day- today it was a scary looking herbal lotus soup, but actually tasted quite pleasant and like a vegetable broth. The pan fried noodles were decent, though it came with too much sauce and mystery meats on top. After a few bites of the meats which were brown, chewy, and okay, nasty- who knew what the heck they were, I just stuck to the crispy noodles and greens. My friend also ordered a pork sandwich. After my bite, I still wanted to eat more char siu and rice. The drinks were also just okay. A lemon and honey drink was too sweet while the lemon ice tea tasted just like the tea they served for free. If you want to lounge over tea and snacks, then you're better off with the teas and milk teas at Chun Shui Tang which has quite a few locations now. While I strongly recommend the Sorrowful Rice (AKA the char siu egg rice bowl), everything else that day seemed to be a miss. While eating, my friend told me that the inspiration for this dish is actually from the the Stephen Chow film GOD OF COOKERY, which I haven't seen yet, but after hearing his story and trying the dish, I want to check it out.